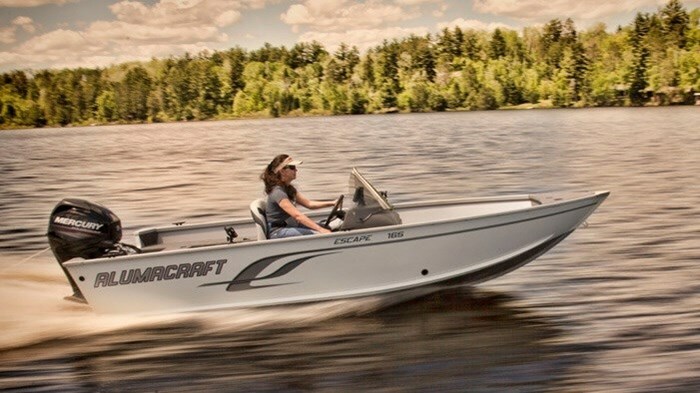 The Escape line-up of four models of side console and tiller layouts in fourteen and a half and sixteen and a half feet is a brand new series for Alumacraft for 2014 and becomes part of its Deep-V category of twenty-eight models ranging from fourteen to twenty feet. 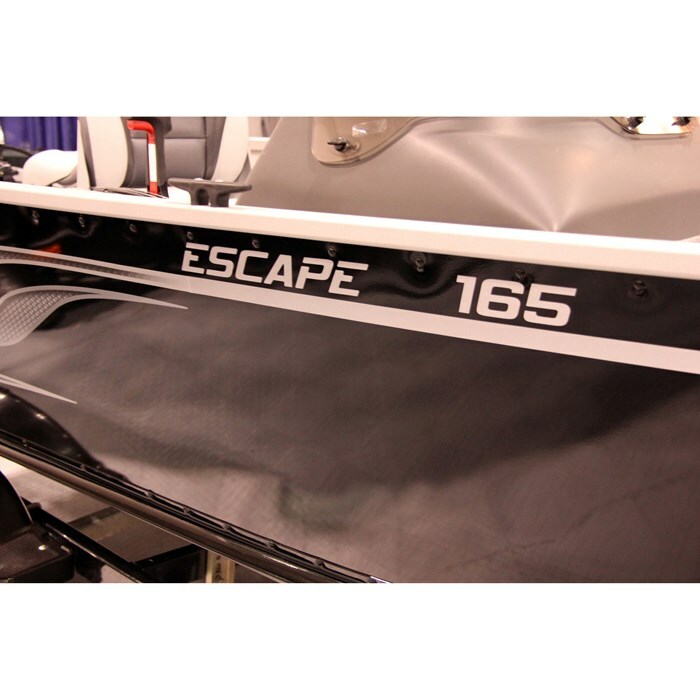 Now in its sixty-eighth year of boatbuilding, these new Escape models are four of a total of ten new models of aluminum boats introduced by Alumacraft this year. 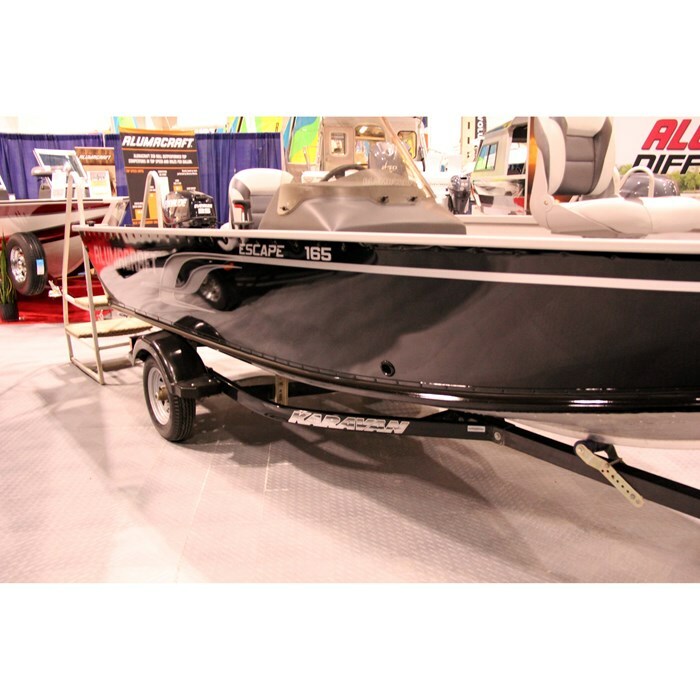 These ten new models are part of a huge lineup of over ninety models from ten foot flat bottom Jon boats to over twenty foot deep-V boats that the Alumacraft® Boat Co. of St. Peter, Minnesota and Arkadelphia, Arkansas is offering for 2014. 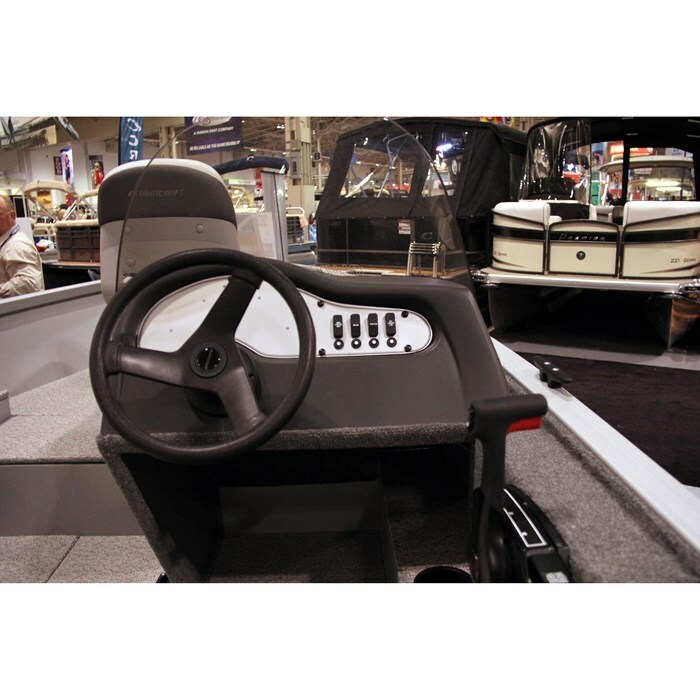 These models include a vast selection of dual console, side console, centre console, tiller, utility, crappie, and Jon boats plus aluminum canoes. Some are welded aluminum; some are riveted. Alumacraft claims these new Escape models offer “Exceptional value with all the features of the big boys.” Since, with the sole exception of the addition of the side console with its steering wheel, windscreen, and a place to mount instrumentation, both the CS (side console) and tiller models of the sixteen and a half foot Escape 165 are absolutely identical in all respects including layout, features, and available options, this review can apply equally to both models. With the addition of the side console plus steering etc., at 696 pounds without motor, the CS weighs fifty pounds more than the Tiller model but both models are ideal size and weight for easy towing capabilities, especially behind today’s smaller vehicles. 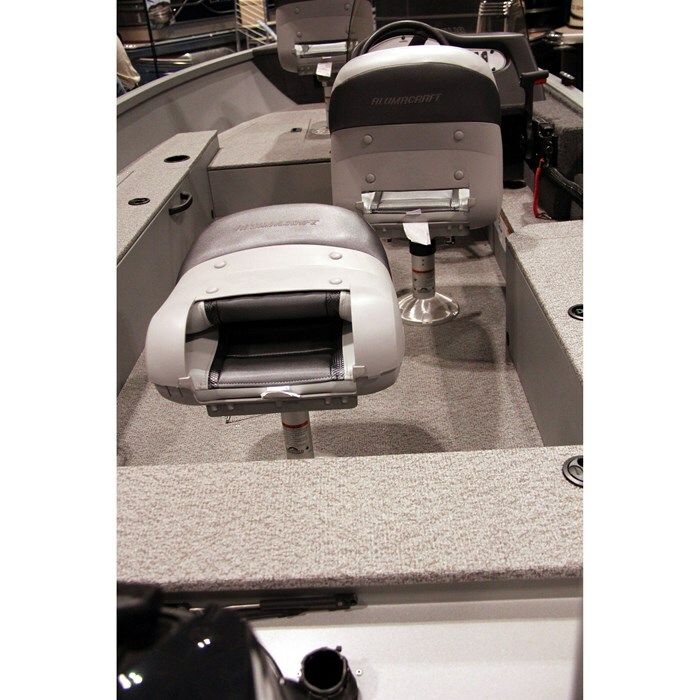 The console itself with molded anti-glare top and flat face provides ample room for installing any desired motor instrumentation and / or fishfinder and GPS capabilities. As stated previously, all else is identical in both the side console and tiller models. The driver and passenger seats are slightly staggered with the passenger floor base mounted just ahead of the driver’s seat base. Two high-back deluxe seats come standard with two additional in-floor bases in which to mount them - one toward the rear of the cockpit and the other in the raised forward casting platform. The driver’s seat comes standard with a slider. Carpet is the standard floor covering with vinyl being optionally available. There are a considerable number of storage compartments provided within the Escape 165 with two large in-floor compartments within the raised bow casting platform plus more storage under the very forward trolling motor mounting deck. In addition, and unusual, are not one but two cockpit in-floor storage compartments plus another beneath the starboard gunnel along the inner hull sides. Opposite along the port side is a lockable rod storage compartment capable of handling rods up to eight feet in length. The aft stand-up-only casting deck has a full-width hinged lid revealing storage capabilities for the portable gas tank, starting battery, and other sundries. There is no in-floor seat base provided on this aft platform as the rear cockpit seat base serves that purpose in this model. Virtually the entire aft portion of the bow casting platform houses an in-floor 13-gallon dual aerated livewell with timer and lighting. Alumacraft’s integrated AlumaTrac™ system for mounting fishing accessories such as rod holders, etc. along the gunnels is standard with the Escape 165 and several accessories to enhance your fishing pleasure with this system are optionally available. Other notable available options from Alumacraft include a MinnKota trolling motor, Lowrance or Humminbird graph fishfinders and/or GPS, plus custom travel covers. You may also want to choose a ShoreLand’r, Eagle, or EZ Loader trailer. As an independent manufacturer, Alumacraft states that it is “the only major fishing boat manufacturer that offers all five major motor brands.” Therefore go with your favourite brand up to a maximum of 50 horsepower in the Escape 165. Factory test results of an Escape 165 CS powered by a Yamaha F30LA four stroke, 30 horsepower, with two persons on board and an as-tested weight of 1,582 pounds, produced a WOT (Wide Open Throttle) top speed of almost twenty-one miles per hour at 5800 RPM. Optimum cruising speed with this setup was found to be 15.1 miles per hour at 4500 RPM while consuming 1.7 gallons (US) of fuel per hour and achieving almost nine miles per (US) gallon. Given these test results, 30 horsepower may be all you ever need but with a maximum allowance of 50 horsepower, there is lots of room for even more performance.